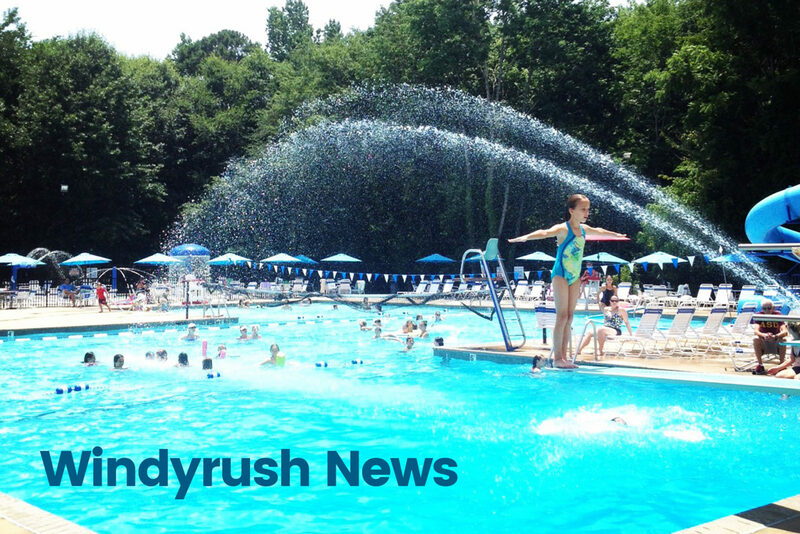 We’ve officially closed the books on the 2018 Windyrush Swim Season and it was one for the record books (and record board!)! We finished the season in second place with a 5-1 record in the top division in the league. 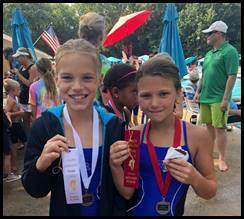 Our All-Star swimmers swam an incredibly exciting meet and landed a third place finish, setting us squarely amongst some of the fastest swimmers in the city! 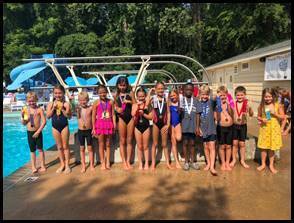 Coach Diane’s Shrimpers and Sea Horses learned so much and made great improvements- by the end of the season, almost all of them were swimming across the pool on their own and a few were even competing with the 7&8 year old Dolphins in meets! The Dolphins blazed across the pool this year. 25 swimmers set ten new individual team records and ten new relay records- that means half of our relay records are new as of this year! 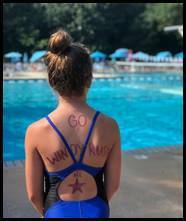 Our coaches watched so many swimmers progress through the season- some learned how to do the butterfly, some gained confidence diving off the blocks, and others completed their first 50 meter races. 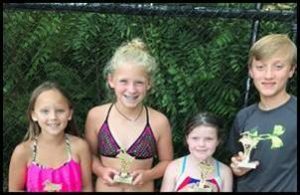 All of our swimmers made significant contributions to our team and we’re proud of each one. The season wrapped up with an ice cream awards banquet where swimmers were recognized for their achievements in the pool and on the team. Cass Jackson was given the Ryan McGee Spirit Award. This award is given in memory of a special young man who was an exceptional teammate, loved our sport, and brought a positive attitude anywhere he went. Congratulations, Cass! 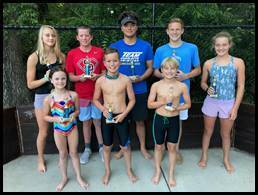 Our High Point (and Shrimper MVP) award winners are: Ava Ward, Case Olsen, Erin Greathouse, Lawrence Benchich, Zetta Grace Bartee, Carter Medlin, Lanie Holden, Granger Bartee, Katrine Luh, Kenan Dean, Lindsay Nowak, and Conner Johnson. Thanks to everyone who worked hard to make this season a success- all our parent-volunteers, the pool staff, and, of course, our fantastic team of coaches. Great job, everybody! We’ll see you again in 2019. The 2018 Dive Season has finally wrapped, and what a season it's been. On paper, a casual observer would consider and 0-4 regular season and 3rd place all-star finish less than stellar. But our athletes, coaches and families know better and we have a lot to be proud of. Some moments ended with ribbons, others in big hugs -- all of them we're awesome and that's what makes this sport great. Alyce Emmerton -- one of our youngest divers -- competed a back dive, front dive and front flip at our first meet. Last year she only had two dives, so to see this young lady come out of the pool and grab her parents and coaches with so much excitement -- it was priceless - no ribbons necessary. Both Raegan Leckner and Ellie Cressman worked hard all season to land a one and half flip. That takes courage and determination. Way to go, ladies! Zeke Bugenski - a second year diver who is 8 years old -- won the 9-10 Boys division at our second meet. It's a really hard division, but Zeke showed up and showed out! And he got a big blue ribbon to show for it. Vivian Cressman is only 11, but she dove in the 15-18 Girls division at the all-star meet. No one would have ever guess that this future diving star still has seven years of eligibility. Something tells me there will be lots of trophies coming her way. Chanie Scales stepped up at the all-star meet, diving up an age group. She did so well, she brought home third place. Adam Barnes and Virginia O'Brien joined our team again this year as exhibition divers -- a great option for nonmembers who want to learn more about the sport. While they didn't get an opportunity to compete, they showed up at practice every day with great attitudes and participated in the meets, even though they couldn't place. Thanks Adam and Virginia. We loved having you as part of our diving family. And, one of my favorite moments all season, Patrick Riesmeyer at the all-star meet. This high schooler competed in pig tails -- a hair style that some of our youngest divers chose for him, and he owned it. Now that's teamwork! There are so many more. Every athlete on this team had a shining moment. Whether at practice or at a meet, this team was special. I can't speak about the season without highlighting our amazing coaching staff. I love these kids. Warren Layne ( my original favorite diver and son) and Parker Pounds have given so much to this team. First as divers and now as 5th year coaches. Between the two of them they've given nearly 25 years to this team, and I am grateful. I'm hopeful coaching will fit their busy college schedules next summer, but if not, they have forever cemented their mark on this team and will always be welcomed. And our team is in good hands; I've already asked Addie, Greyson and Michael to come back next season. And, if the stars align, we may be fortunate enough to have Luke and Ethan Foster back helping with some clinics. They are quite busy with their year-round diving careers though. They just qualified for Junior Nationals! Congrats Luke and Ethan! To all of our parents, volunteers, kids and everyone else who helped with t-shirts, scheduling, banquets and logistics, thank you for one amazing season. Keep hitting the boards; the 2019 season is less than a year away. If you missed the banquet, awards are listed below and you can pick up your trophies in the guard room. Conventional swimsuits are required, no cut-offs or street clothes allowed. Overly revealing swimsuits (i.e. “thongs” or string bikinis) are prohibited as are Speedos worn outside of competitive swimming. The WRCC board reserves the right to determine if swimwear is inappropriate. Members and guests will be asked to leave or change attire if it is deemed inappropriate. Due to safety reasons large rafts will Not be permitted on weekends this includes Friday afternoons. Small inner tubes (24” or less) and noodles are allowed at all times. Please remember glass is NOT permitted on the pool deck, this includes inside your pool bag and inside your pool coolers. As a convenience you may purchase guest passes. Passes may be purchased at the lifeguard desk. Our software system with keep up with the amount of guest pass visits. Masters Swim is adult lap swim. Free for members. Guests $5.00. Diner cards may be purchased for $10.00.These are laminated cards that you may purchase and use for future purchases. Great for your children to use! Hey, Johnny Park! 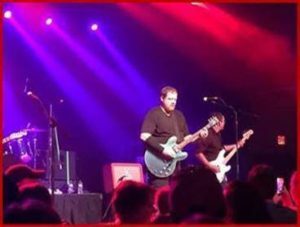 is a Foo Fighters tribute band based out of Columbia, South Carolina. Members Jeremy Polley, Lucas Johnson, Morgan Johnson, Philippe Herndon and Jefferson Nunnery pride themselves on providing the same high energy, full tilt rock show that has given Dave Grohl and company their world-class reputation. From screaming vocals to searing guitar licks, Hey, Johnny Park! 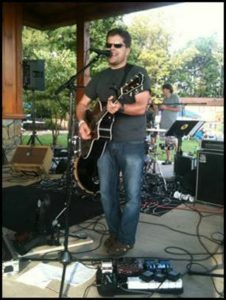 performs hits from the two decade plus career of the Foo Fighters,including such anthems as "My Hero," "Walk," and "Everlong." Want to know more click on the link Hey, Johnny Park! 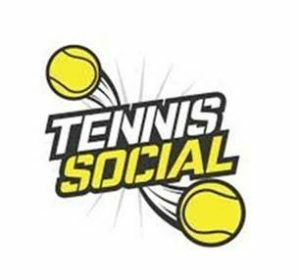 MARK YOUR CALENDARS for our next Tennis Social: FRIDAY FUN NIGHT! Play will feature a combination of Men’s Doubles, Ladies Doubles, and will finish with Mixed Doubles. No entry fee! Pot Luck Event: Bring a dish of something fun to share and beverages of your choice. Here we are in the heart of the summer. A very hot summer I might add. 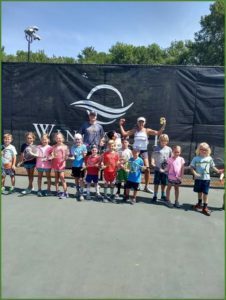 Summer Junior tennis camp is thriving. Adult classes are holding steady. Make certain you are sitting down. "A few Good men are venturing into the world of" maybe there is still some things in life I can still learn and improve on.?! Yes, it's true. A few male humans have begun taking lessons or joining the classes. Can you figure? We have classes Monday, Tuesday night and a team practice Tuesday mornings. I would love to have a pure physical workout tennis class Wednesday nights. Ladies and men. OPEN! We need some male type humans who can handle competition against our women of the New Millennia. ARE THERE ANY? After school tennis begins right after labor day. Details to follow. The 2nd Special Event in the new ERA of WR camaraderie. Summer Tennis Camp-Space is available for the remainder of July & the month of August! *Please remember that children need to be supervised at the tennis pavilion if they are ages 10 and under. Appropriate tennis attire must be won on the courts. Guests must be accompanied by a member. Guest fees are $5.00 per guest. Please leave your guest fee payments in the box on the clay court entrance marked “Guest Fees”. We are accepting tennis only memberships. Membership initiation fee is $550 plus yearly dues of $550.00. If you know someone who is interested in joining please have them emailoffice@windyrush.com to join. Interested in using the ball machine? Contact Susie for instructions attennis@windyrush.com. Yearly fee is $20.